eReceipts are only provided for automatically imported transactions that are in US Dollars. These can be imported directly from your bank account, but will not import for a CSV/OFX imported file of bank transactions. We will not generate an eReceipt for lodging expenses. Many banks do not provide complete or accurate category information, so we might at times mis-identify merchants and erroneously generate an invalid eReceipt for hotel purchases. Similarly, you are free to re-categorize expenses, possibly causing us to generate an invalid eReceipt for a purchase made at a hotel. In either case, our Expensify eReceipt Guarantee does not cover purchases of lodging at hotels and motels. My eReceipt didn't generate. Why? 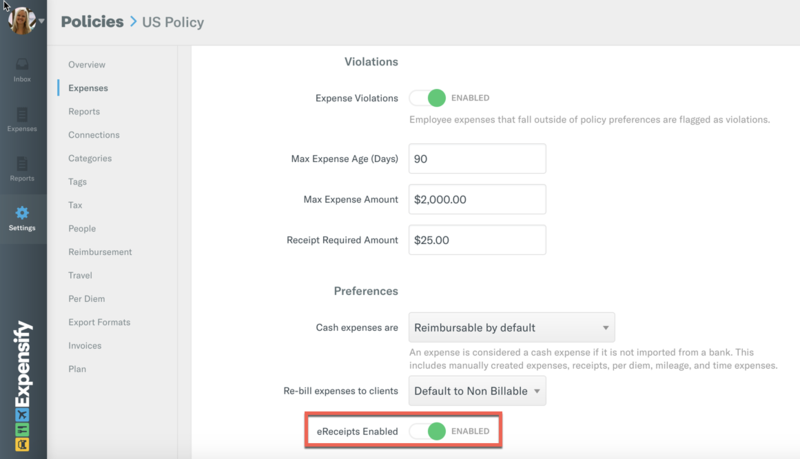 Your admin has disabled eReceipts per the policy settings. If you're sure your policy allows this, make sure to check that you are using the correct policy. You have imported your card via a spreadsheet. We can only generate eReceipts for directly connected cards/banks. Your connected card or bank is outside of the US. Are these acceptable receipts for the IRS? Expensify eReceipts meet the requirements for IRS Documentation as per Publication 463. The IRS will not accept an eReceipt for purchases on lodging, for example at hotels and motels. Will this eReceipt still merge with a receipt that I SmartScan with the app or email to receipts@expensify.com? Yes! 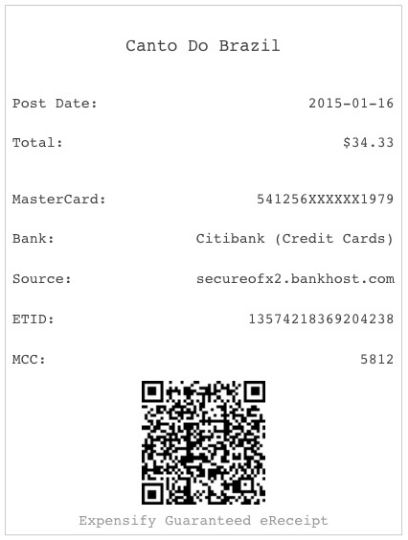 SmartScanned receipts will still merge with and override any eReceipt. Why isn't my eReceipt exporting like my other receipts do? Expensify supports exporting receipt images, in addition to the receipt URL for our integrations with QuickBooks Online, Xero and Bill.com. (With Xero, these export as part of the report if smaller than Xero's 10mb limit). As eReceipts are HTML (code) placeholders, they will not be exported alongside their corresponding transaction - this is because QuickBooks Online only accepts images/PDF attachments. Still looking for answers? Search our Community for more help!